We started out as a women’s choir back in 1960 – a part of the activities of the Stirling branch of the Country Women’s Association (CWA). It was there that the choir had the enjoyable experience each year of performing as part of a CWA massed choir. Gradually the scene changed when the choir were invited to perform for all sorts of organisations, either during the day or evening. There were young mothers who wanted to sing but did not have the time to partake in the life of a CWA branch. There were also women who had joined the CWA only for the choral singing. In 1964 it was decided by the Musical Director, MARY ARCHER, that music was the primary object of the group and broke away from the CWA to form THE MOUNT LOFTY SINGERS. Up to that time it had not been necessary to rent a rehearsal room as the choir had access to the CWA hall and piano. However upon becoming independent this changed. The Kindergarten at Stirling became the first venue and choir rehearsals were changed from afternoons to evenings “as there were a number of young mothers who were chorally inclined and at night there was a family sitter available in the form of a husband“. The choir progressed happily as a women’s group for several years gaining recognition in ability and being asked to perform at various functions. The main programme became ‘Music & Models’ with choir music combined with the parading of period clothes of which the Music Director had a varied collection – commonly known as “Mary Archer’s old clothes”. The fashion parade developed as an interest in the programme, and combined with good music, the invitations to perform began to roll in. Members of the public kindly donated, or loaned, family treasures. Over a period of time a wardrobe and the music library was gradually built up. In 1967 DAVID LOCKETT stood in as Musical Director for a period of 3 months while Mary was overseas. In 1977 MAX PEARCE took over as the Musical Director. He was a conductor of wide choral experience having been a member of the ABC Adelaide Singers for several years. Max brought a new variety of choral works to the choir. It was during that time the choir rehearsed and performed concert versions of operettas such as ‘The Rebel Maid‘ and ‘Merrie England’. The choir even took the plunge and ventured over to Port Lincoln to join the local choir to present ‘Merrie England‘ with the Adelaide Consort as soloists. It was during this period that men were ‘allowed‘ to join and became an integral part of the group. The choir also joined Adult Education enabling Max and ELIZABETH ANGROVE, the accompanist, to be paid. Prior to that time the work of both conductors and accompanists had been on a voluntary basis. Max left in 1980 and the following year the choir had the enviable good fortune to obtain the services of retired ABC conductor VERDON WILLIAMS as Musical Director. The presentation of major works continued with exciting performances such as ‘Call the Tribe‘, ‘Amahl and the Night Visitors‘ and several Gilbert & Sullivan operettas. Four years later Verdon was offered the lucrative and interesting job of assistant conductor with the Australian Ballet. 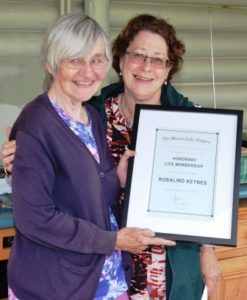 In 1981 ROSALIND KEYNES became the choir’s accompanist. Wanting to learn piano at the age of 3, Rosalind’s mother began teaching her keyboard skills that would last a lifetime. The talented Rosalind at the age of 13 joined the University of Adelaide Bach Choir as a singer. She obtained her Bachelor of Music degree playing piano and violin from the Elder Conservatorium . Prior to joining the choir Rosalind had also been organist for churches in Piccadilly, Uraidla & Summertown and for more than 10 years performed with the Hills Musical Company. At the time of her appointment Rosalind was playing at the Studio Arts Centre for ballet classes, was the organist at St John’s Spiritual Church in Adelaide, leader & first violinist with the Australian Retired Persons Association Orchestra (based in Adelaide) and also played with the Mitcham Orchestra. For various reasons, mainly financial, the choir left Adult Education. By now the choir was well established and able to sustain its financial obligations. In 1985 the choir had another change in direction with the appointment of SHIRLEY WHITE-STEVENS as Musical Director. She brought her style & talent and it was in 1991 that the Mt Lofty Singers won First Prize in the Choral Section of the Adelaide Eisteddfod – a most worthy achievement. In August of that year, Mary and her family returned to the USA. JILL McGREGOR was chosen by the choir as the next Musical Director. She also brought her special brand of talent and the choir continued to strive forward, gaining in membership, experience and musical assurance. Sadly due to pressures of work, Jill resigned at the end of 1993. In 1994 BRIAN CHATTERTON from Macclesfield became the choir’s next Musical Director. He had been involved as Chorus Master with several State Opera productions including, ‘Cosi Fan Tutte‘, ‘Midsummer Marriage‘, ‘Don Giovanni‘ and ‘HMS Pinafore‘. Brian was the former director at the Elder Conservatorium & Performing Arts at the University of Adelaide. In late 1994 GRANT DOYLE became the choir’s youngest Musical Director. At the age of 24 and a university graduate with first class honors in vocal performance, Grant had wide experience in music from lead guitarist in rock bands to singing with the State Opera. At the time of his appointment he was the Conductor of the Adelaide Boys’ Choir, was singing Escamillo in ‘Carmen‘ with Co-Opera, and rehearsing with the State Opera for the ‘Pearl Fishers‘. Hoping to specialise in opera singing, Grant stepped down from his position with the choir in 1997 after being awarded the Overseas Elder Scholarship to continue his musical studies at the Royal College of Music in London. Grant also received a scholarship from the Victoria League for Commonwealth Friendship (South Australia). DENISE ROTHALL from Murray Bridge was our next Musical Director (1997-2001). Denise had gained her Master of Music (Majoring in Choral Conducting) at the Southern Methodist University in Dallas, Texas and in a similar manner to our past Musical Director’s, she brought to the choir her brand of talent and excellence in choral singing. In 1998 the Mt Lofty Singers, by way of two fund-raising concerts, raised a total of $1820 to assist the Sunset Rock Uniting Church purchase a new Yamaha grand piano valued at $35,000. Needless to say, the donations from the choir were greatly appreciated. Organist and choirmaster PETER KELSALL was appointed the choir’s new Musical Director in 2002. Peter brought a wealth of experience to the group. He had studied organ and piano at the University of Adelaide, had a Masters Degree in music theory and had also undertaken studies in choral conducting with the US conductor, Carl Crossin. BARRY WILKENS O.A.M. stepped into the position as the choir’s Musical Director in 2006 for a period of 2 years. He had been conducting choirs and orchestras since the age of 16. Barry conducted his first ‘Messiah’ at the age of 18. As a self-taught musician with no formal training, Barry had conducted the Ballarat Light Orchestra and the Ballarat Festival Orchestra for over 15 years. He had also been musical director and conductor of more than 60 stage musicals. In 2000 Barry was the first Australian to be inducted into the International Festivals & Events Association (IFEA) “Hall of Fame” in New Orleans and in 2004 he was awarded Life Membership to IFEA. In 2008 NIKKI AITKEN became the choir’s next Musical Director. She had studied at Flinders University and the Elder Conservatorium, had a Music Degree majoring in Vocal Performance & Theatre Studies from the University of New South Wales and had also starred in her own cabaret shows at the Adelaide Fringe. Nikki’s excellent credentials charmed all during the first few rehearsals, especially the Tenor and Bass sections. It was rumored that one member of the Bass section even defected to the Tenors for a guarantee of front seat privileges! Our current Musical Director, OLGA STRIZHAK, joined the choir in 2011 and brought a new dimension to our music – ‘the wow factor’. Born in Uzbekistan, Olga’s parents were very musical. Her mother played mandolin & accordion and formed a folklore group in her village that sang old Russian songs and ballads. Driven by the love of song and music at home, Olga studied music full time for eight years. Her excellent results allowed entry into a prestigious Siberian music college to study for another four years, often practising for up to 10 hours a day . Qualified with a Bachelor of Music degree in music education, choir conducting and music theory and history, Olga began her career in various Russian choral groups, schools and the local police academy. Olga also taught music in Dalmatovo Orphanage and many Russian primary and secondary schools. Since her arrival in South Australia, Olga has volunteered as a private music teacher, choir conductor, musical director, singer, pianist and accompanist for community and eductional groups together with creating or assisting with numerous musical programs. Olga has also worked with the Monteverdi Singers, the Woodville Concert vocal ensemble, the Dom Polski Centre and the Metropolitan Male Choir. She has also taught at many schools including St Paul’s, Kildare, Rostrevor, Montessorie and Seymour. 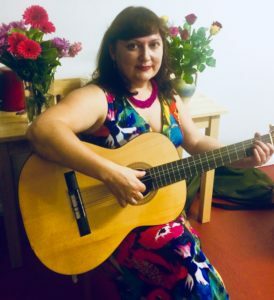 Olga is currently teaching at various schools in the Adelaide Hills area and conducts private lessons (at very reasonable rates) in singing, piano and guitar. All standards are catered for including the Australian Music Examination Board (AMEB) exams (to contact Olga CLICK HERE).